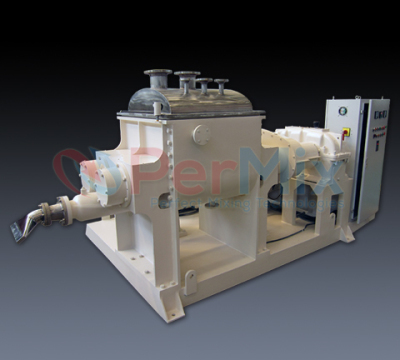 The PerMix PSG series Sigma Mixer, which is also known as the Double 'Z' Arm Kneader, is used for the mixing-kneading of materials with very high viscosity (over 500,000 cps). 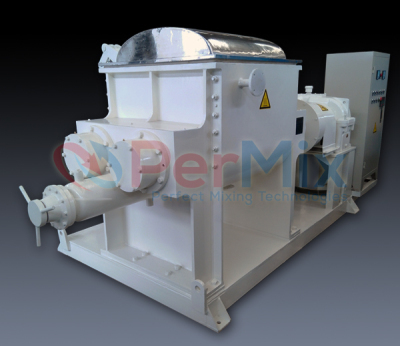 With its unique design of Z-shaped mixing tools installed in two semi-cylinders, the PerMix PSG series Sigma Mixer is able to provide a combined functions of compressing, stretching, folding, kneading & mixing, which makes it widely used in the chemical, food, sealing compound and paint industries, among others. In the PerMix PSG series Sigma Mixer, there are two special designed Z-shaped rotating elements installed in a W-shaped chamber, the intersection of which forms a saddle piece and meeting tangentially just above the saddle. They rotate at different speeds (usually in the ratio of 3:2) and in opposite direction. 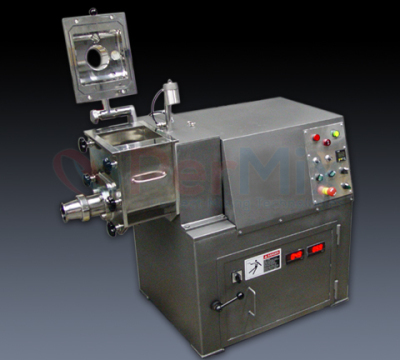 The mixing action is a combination of bulk movement, smearing, stretching, folding, dividing, and recombining as the material is pulled and squeezed against blades, saddle, and side walls. Continually new layers of material are compressed and folded over one another and are subjected to shearing forces. New surfaces are formed and the components can penetrate. The blades, which are ground and polished, successively sweep all points of the trough surface during each revolution, at the same time dividing the batch continuously across the saddle piece and thereby rapidly affecting a perfectly homogeneous mix. For small machines tilt can be of a mechanical type (handlever or handwheel). For greater machines electro-mechanically or hydraulically powered. The extrusion-discharge screw is located in the saddle section and runs in a cylindrical trough tangential to, and below the 2 mixing blades. 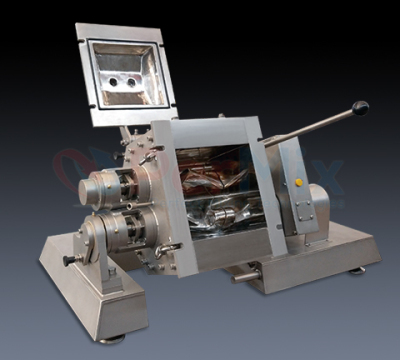 During the mixing cycle the screw moves the material within the reach of the mixing blades, thus assuring a thorough blending of all the ingredients, and, at the same time, accelerating the mixing process. At discharge time, the direction of rotation of the screw is reversed and the mixed material is extruded through suitable die openings in the side of the machine. 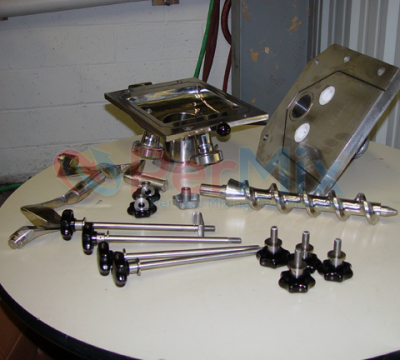 The extrusion screw has its own separate drive so that blades and screw operate independently. PerMix offers PSG-D series 'Duplex' Sigma Mixer which is specially designed for even more intensive kneading applications. They are twin basin kneading machines with two horizontally arranged kneading blades, which are deeply geared into one another and strip themselves reciprocally. The kneading blades are turning acc. to a ratio 1:2. Because of their different speeds, the blade sides approach and withdraw alternately. 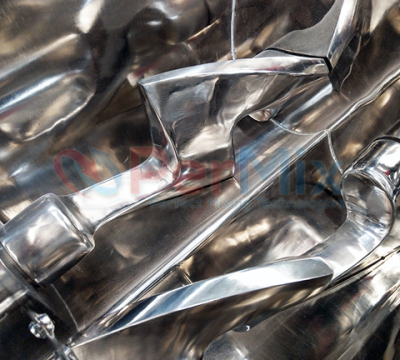 This causes high pressure tensile and shearing rates and therefore heavy friction in the kneading medium, which creates excellent dispersing and homogeneity. The shape of the kneading blades enables a steady flow of material from the side walls of the kneading trough to the middle of the kneading trough.